Lady Macbeth: Comedies end with a marriage. This film begins with one. Draw your own conclusions. 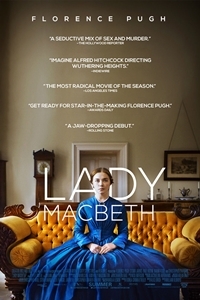 William Oldroyd’s elegantly executed debut feature Lady Macbeth may prove to be the sort of quiet breakout for star Florence Pugh that Martha Marcy May Marlene was for Elizabeth Olsen (as opposed to the more explosive entrance that Jennifer Lawrence made in Winter’s Bone). Pugh’s Katherine, like Olsen’s Martha, must entrance the audience instead of convincing it or winning it over, and she succeeds, overcoming the need for backstory, sympathy, or even straight-arrow consistency of character. Her version of the lethal Lady is both more passive and more active than her Shakespearean namesake (the story here is an adaptation of the Russian novella Lady Macbeth of the Mtsensk District): she is more driven to than driving toward her murderous acts, but she also doesn’t waste time trying to convince someone else (e.g., her lover) to do the deed. She is presented with a problem: a wretched husband who will not assist her in her matrimonial duty to produce an heir for her even more wretched father-in-law. She is also presented with an opportunity: an ardent young servant who knows a good thing when he sees it. And so she takes the necessary steps. It’s not a complicated story, but there are complications, both external and internal. And while this is no morality tale, it doesn’t pretend to take place outside the moral universe. It’s smart about evil, especially about the way it tends to radiate. Beautifully, starkly photographed by Ari Wegner. Matthew Lickona: Why this story for a first feature? William Oldroyd: The central character, Katherine. We’ve seen this setup before: young women trapped in lovely marriages who have affairs and then are sort of silenced or exiled. We had a chance to redress that. What Katherine did was so surprising; it felt like an opportunity to do something different with the British costume-drama genre. I love British period dramas; I grew up on them. But I loved the surprise here. ML: She gives the audience a workout, yanking their sympathies back and forth the way she does. WO: [Screenwriter] Alice Birch emphasized the dire position Katherine found herself in — a young woman who was the property of her husband and not allowed to go outside — as justification for her actions. But at the same time, she does do things that are problematic and difficult and contrary and complicated. It’s the same as when we watch [House of Cards’] Frank Underwood, or [There Will Be Blood’s] Daniel Plainview, or Richard III. Morally, it’s very questionable what they are doing, but we are compelled to watch them, and in some respects, we are compelled to root for them to succeed in whatever their goal is, even though they kill people and act despicably. We were thinking, Just because she’s a woman doesn’t mean she can’t be like those men. ML: A lot of the burden of keeping the audience on the hook lies with the actor in those cases. And Florence Pugh, who plays Katherine, doesn’t get much chance to explain herself verbally. WO: We asked to have rehearsal time going in because we wanted to be clear going into the shoot what each thought was for Katherine. We knew everything was going to be read through the face. But after those rehearsal days, Florence knew exactly what she was doing, and we could be playful. She could just go for it. Also, shooting in sequence was very important. We shot the film from beginning to end, which meant that it was easier for Florence to chart her progression, or demise — however you want to see it. She’s a good actor, but when you see her in that final scene, she’s just been through a four-week shoot. There was a cumulative effect. ML: Talk about the use of nature. WO: We wanted to create contrasts. We knew she was going to spend most of her time indoors. That was her sentence, if you like — to be a house prisoner — and we were going to create this very sort of airless space. So when she does go outside, we needed a strong contrast to that: the wuthering wind and wild moorland of Northeast England. We felt she was a creature who belonged there. And it also helped with the sense of isolation. Ari Wegner, our director of photography, went up there and started putting pictures of bruised and battered naked bodies together with pictures of trees and branches and the heath and the moorlands. It felt like they were two landscapes: the physical and the geographical. You see the naked bodies [of the lovers] on the bed, and then that’s juxtaposed with the rotting corpse of a horse, which is meant to represent the difficulties of their relationship and what’s to come. Alice actually wrote in quite a lot of animal references. Katherine bites and scratched and licks like an animal. Anna the servant gets trussed up like a pig. You’ve got the lover Sebastian’s connection with the dogs. And her father-in-law Boris has this cat as sort of a familiar, who starts to sort of represent him after death. ML: At some moments, I was thinking, This is strongly moral; at others, This is strongly immoral; at others, This is just amoral. Do you think there’s a morality at work, or does Katherine just respond to stimuli and act to preserve herself? I ask because at one point she starts to bond with the little boy, even though he stands in the way of her dreams. ML: Finally, I couldn’t help but notice the hymn at Katherine’s wedding that opens the film. WO: “Praise to the Lord, the Almighty.” I chose it because it’s about pledging allegiance to a lord. She’s entering into this family and agreeing that this man is going to be her lord and master. WO: Exactly the opposite of what’s going to happen to her.